Criticising the Andhra Pradesh, West Bengal and Chhattisgarh governments' decisions to block the CBI from entering the respective states without permission, Prime Minister Narendra Modi alleged that they have something to hide. "What wrong have they done that they're feeling scared? Today they don't accept CBI, tomorrow they won't accept some other institution. Army, Police, SC, EC, CAG all are wrong, only they are right," he alleged. Speaking about the controversial Ayodhya issue, Modi said: "Look at the Ayodhya matter. Congress is using their lawyers to stall the issue. Congress was even ready to impeach the CJI. We should not forget what Congress is doing and we should not let anyone forget it." Modi also responded to Congress' continued "chowkidar chor hai" jibes over the Rafale deal, and said that the 'chowkidaar' will not stop at anything to expose the Congress' lies and games. "No matter how much the Congress resorts to name-calling, the 'chowkidaar' will not stop," he said, amid cheers and applause. In a continued attack on the Congress, Narendra Modi said that during the Congress' tenure, there were only two ways to get a loan. In the common process, one could ask a bank for a loan, and in the Congress process, banks were forced to give money to their "greedy friends." One could ask for a loan of Rs 10 lakh to set up his or her home as part of the common process. But in the Congress process, loans worth hundreds of thousands of rupees were given over a phone call, Modi said. "You would need a second loan to pay off the first loan in the Congress process, a third to pay off the second, and so on," he added. Modi reiterated his government's plan to establish a 10 percent quota for upper caste poor. "This is not just reservation but an attempt to give a new dimension to the aspirations of youths, who are left behind. The provision of reservation done by Babasaheb Ambedkar is as strong today as it was then. And will continue to remain strong," he said. The prime minister in his speech expressed pride the BJP government "has not been accused of corruption." "It has happened for the first time in the history of the country that a government that came into power with an absolute majority hasn't been accused of corruption," he said. 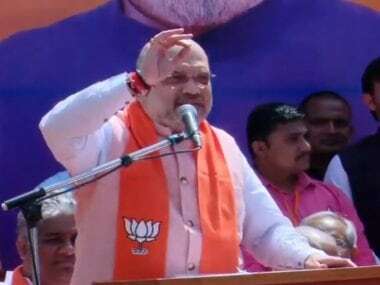 In his address, BJP chief Amit Shah said that the upcoming Lok Sabha polls is an election for national security, development and pride. BJP president Amit Shah in his address on the second day of the BJP national summit said that the Narendra Modi government has been working towards freeing India from the Congress' three contributions to India: nepotism, classism, and appeasement. Adding to his attack on the Opposition, Shah said that the mahagathbandhan was formed out of greed. "It is good that this contest is taking place. 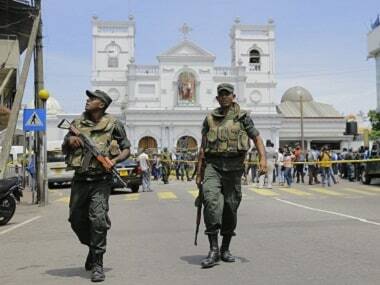 I know that our cadres will lead this fight for us and ensure us a victory," he said. Union finance minister Arun Jaitley said that the next five months are "strictly election months. In every article we read, every news we watch, we should keep in mind how to win and bring PM Narendra Modi back to power." Speaking on the controversial Rafale deal, he said that the prime minister has saved thousands of crores of rupees, and is working to bring back all the money that the Congress blew up, which should have gone to the poor. He further stated that the BJP-led government has nothing to be ashamed of. "The Bharatiya Janata Party government has not done a single act that allows our workers to tilt their heads," he said. Speaking about rumours of a united Opposition ahead of the Lok Sabha polls; Uttar Pradesh chief minister Yogi Adityanath said that parties who have had no relation in the past are now coming together against the BJP to deter the progress that the party has made against terror and other problems in India. He also listed the BJP government's achievements in Uttar Pradesh. "Within 1.5 years, the UP government has built houses for 18 lakh poor individuals irrespective of their caste or religion, under Pradhan Mantri Awas Yojana." He added that meanwhile, in the five years of the previous SP government, only 63,000 houses were built. On day one of BJP's national council meeting, party chief Amit Shah sounded the 2019 poll bugle in his inaugural address on Friday. 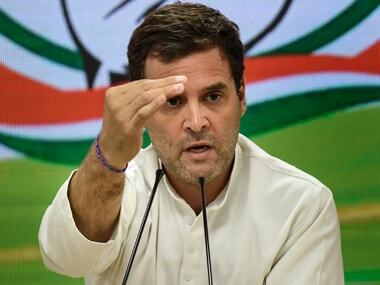 He said the coming Lok Sabha elections would be like the decisive third battle of Panipat. Amit Shah also hit out Congress president Rahul Gandhi for making "false claims" about the Rafale deal. The party passed the agriculture resolution 'Samruddha Bharat, Samruddha Kisaan' on Friday. It also passed a second resolution on the welfare of the poor. The measures under the resolution include 10 % reservation for the economically weak in the general category. Addressing the BJP national conference on Friday, Union minister Nitin Gadkari said that previous governments in India have been guilty of corruption and non-performance. "But after we came to power, good governance, ease of business development has been delivered, just as we promised in our manifesto," he said. The prime minister said that Opposition parties are only coming together so that a 'majboor' (dependent) government can form, and they can continue in their corrupt endeavours. But the average citizen wants a 'majboot' (strong) government that will end all corruption, he said. Defence Minister Nirmala Sitharaman, while speaking at the summit, said: "We have not had one major terrorist attack in this country after 2014. This government, under the leadership of Prime Minister Narendra Modi has ensured one thing — that there shall not be an opportunity for terrorists to disturb peace." 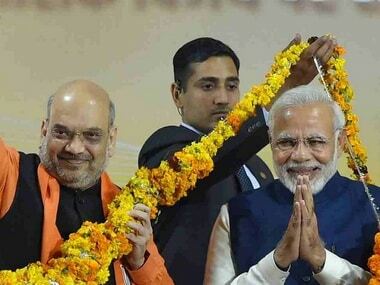 Prime Minister Narendra Modi and BJP president Amit Shah on Friday morning reached New Delhi's Ramlila ground, where the BJP's two-day national convention is underway. Modi will address the gathering at 12.30 pm. BJP National Convention LATEST Updates: Speaking about the controversial Ayodhya issue, Modi said: "Look at the Ayodhya matter. Congress is using their lawyers to stall the issue. Congress was even ready to impeach the CJI. We should not forget what Congress is doing and we should not let anyone forget it." Prime Minister Narendra Modi will address the BJP National Council meeting on Friday, which is the second and final day of the summit in the national capital. 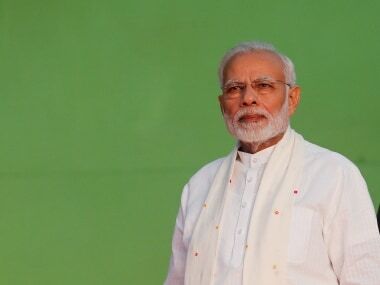 Reportedly, the prime minister will lay out the election agenda of the BJP and NDA alliance in his address at 12.30 pm. BJP president Amit Shah on Friday dismissed the SP-BSP alliance and exhorted party leaders and workers in Uttar Pradesh to prepare to fight for a vote share of more than 50 percent. 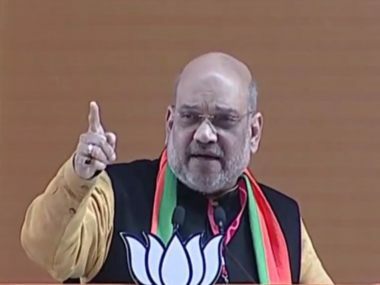 Shah spoke about an emerging “Modi versus the rest” situation in the Lok Sabha polls, and asserted that such a scenario would ultimately benefit the party, as people would see the negatives of the Opposition parties' game. According to reports, the Modi government's "social justice" plank with its outreach to Dalits, backward classes and general category was expected to be the key theme at the meeting. Almost 12,000 party workers and members were anticipated to participate in the summit. Sources said the council may pass three resolutions, highlighting the government's "successes" on various fronts ranging from economy to social justice and also dwell at length on the prevailing political scenario.